Nanophotonics is the study that has anything to do with light at the nanoscale level. The nanoscale level is usually around 1-100 nanometers (nm); a nanometer is one billionth of a meter. Using nanophotonics, researchers at Harvard have discovered that color can be manipulated at the nanoscale even with opaque objects. These kind of objects are impenetrable by light and are believed cannot exhibit thin-film interference effects. Thin film interference effects happen when light waves interfere with each other as they pass through a medium and are reflected back out. As they are reflected back, some colors come out brighter while others are lost. An example of this would be rainbow like colors reflected back from an oily puddle on the street. Federico Capasso, Robert L. Wallace Professor of Applied Physics and Vinton Hayes Senior Research Fellow in Electrical Engineering at SEAS and Graduate student and lead author Mikhail A. Kats used nanophotonics and applied this to duplicate this phenomenon with opaque and non-transparent materials. Their findings is published in the journal Nature Materials. The different colors in this photograph are a result of tiny variations in thickness: just 10-15 atoms of germanium separate the pink color from the violet, and another 10-15 atoms change the color from violet to dark blue. A penny is shown for size comparison. Cappaso and Kats used gold and germanium to build a structure that reflect back predetermined colors. 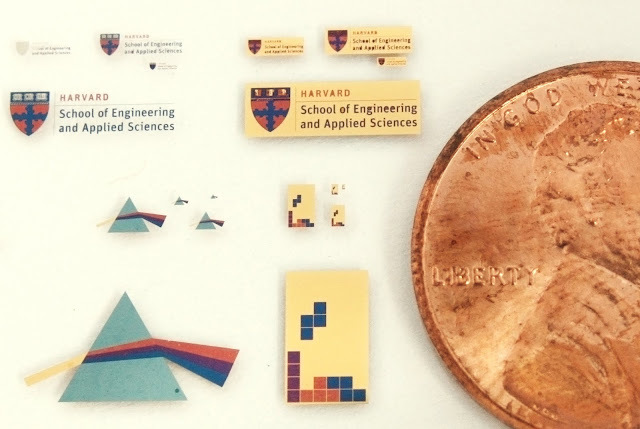 The result of their experiment is displayed at the Harvard's Pierce Hall (see image). The small germanium-coated gold sheet shines vividly in crimson. A centimeter to the right, where the same metallic coating is literally only about 20 atoms thicker, the surface is a dark blue, almost black. The germanium coating on the sheet acts as a 'color trap' where the material manipulates the crests and troughs of the light wave to reflect a custom color. Kats states that this reflection and absorption of light is designed to minimize optical losses and maximize the color effect. These are gold films colored with nanometer-thick layers of germanium. Germanium is applied through sstandard processes such as lithography and physical vapor disposition. This is comparable to stenciling or spray painting it on the surface. This technique surprisingly only requires a coating that is only about 5nm to 20nm to achieve their desired effect. Complex and intricate color designs can easily be applied to any surface regardless of size. 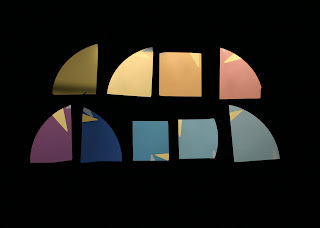 Changing the color, according to Capasso, is easily done by just changing the thickness of the film by a few atoms. This newly discovered technology can be used in various applications such as filters, displays, photovoltaics, detectors, and modulators.